New York is a fantastic baseball city with two of the finest newer ballparks in Major League Baseball. Guests will enjoy premium seats for two games, and plenty of free time to explore the “City That Doesn’t Sleep." The tour hotel will be in Midtown Manhattan close to all the shows, restaurants, and shopping. Book now! 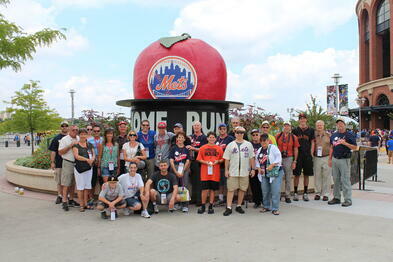 Big League Tours group at Citi Field. Tour pricing is based on hotel room occupancy. All taxes included. "Price of all the tours was comparable, but the services provided by Big League Tours was far superior."